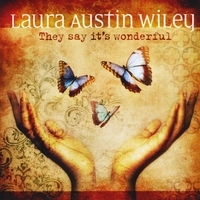 Laura Wiley sings jazz standards from the Great American Songbook, and plays flute solos, backed up by a great trio of guitar, bass and drums. A compilation of vocal classics from the Great American Songbook performed by a jazz quartet. Laura Austin Wiley has sung and played flute in the San Francisco Bay Area for years. As a vocalist, she started out as a singer/actress doing musical theater, and then gravitated toward jazz. As a flute player, she is a trained classical flutist who eventually started playing jazz after realizing that jazz was the genre she listened to in her free time, instead of classical music. Laura plays and sings with her own quartet as well as with Resonance Jazz Ensemble. It is wonderful to hear these standards in an intimate and simple setting. Laura's pure bell-like vocal tone rings true. It is wonderful. Classic jazz tunes with silky smooth vocals. I have other CDs of hers but this one is my favorite so far.